Robin Youngs, Edward Fisher,	The Journal of Laryngology & Otology, Volume 128 Issue 4, p 307. A Robinson,	The Journal of Laryngology & Otology, Volume 128 Issue 4, pp 318-325. S J Muzaffar, C J Coulson, S Burrell, A P Reid,	The Journal of Laryngology & Otology, Volume 128 Issue 4, pp 326-330. S J Daniel, M McIntosh, O V Akinpelu, C V Rohlicek,	The Journal of Laryngology & Otology, Volume 128 Issue 4, pp 331-335. J M Potgieter, D W Swanepoel, B M Heinze, L M Hofmeyr, A A S Burger, H Hamersma,	The Journal of Laryngology & Otology, Volume 128 Issue 4, pp 336-344. P R C Steele, M L Barnes, P D Ross,	The Journal of Laryngology & Otology, Volume 128 Issue 4, pp 345-349. S I Cho, J H Lee, J H Park, N Y Do,	The Journal of Laryngology & Otology, Volume 128 Issue 4, pp 350-355. F Aksoy, A Yenigun, R Dogan, F Yilmaz, O Ozturan, V B Yenigun,	The Journal of Laryngology & Otology, Volume 128 Issue 4, pp 356-359. K A Lightbody, A J Kinshuck, A J Donne,	The Journal of Laryngology & Otology, Volume 128 Issue 4, pp 360-364. 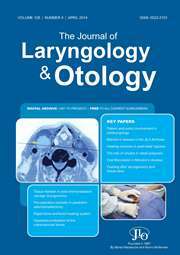 J Powell, U R Ullal, O Ahmed, M Ragbir, V Paleri,	The Journal of Laryngology & Otology, Volume 128 Issue 4, pp 365-367. Michael Persky, Y Fang, D Myssiorek,	The Journal of Laryngology & Otology, Volume 128 Issue 4, pp 368-371. Does early oral feeding increase the likelihood of salivary fistula after total laryngectomy? A A Sousa, J M Porcaro-Salles, J M A Soares, G M de Moraes, G S Silva, R A Sepulcri, P R Savassi-Rocha,	The Journal of Laryngology & Otology, Volume 128 Issue 4, pp 372-378. A C Leong, D D Pothier, J A Rutka,	The Journal of Laryngology & Otology, Volume 128 Issue 4, pp 379-380. J M Fussey, H El-Maghraby, D Rejali,	The Journal of Laryngology & Otology, Volume 128 Issue 4, pp 381-384. A De Ru, W Heerens, M Packer,	The Journal of Laryngology & Otology, Volume 128 Issue 4, p 385. P Trechot,	The Journal of Laryngology & Otology, Volume 128 Issue 4, p 386. R D Angeli,	The Journal of Laryngology & Otology, Volume 128 Issue 4, p 385. F Salim,	The Journal of Laryngology & Otology, Volume 128 Issue 4, p 386.